Latest news: Click here to watch the video recording of my talk at the American School of Classical Studies at Athens (ASCSA) about pioneering Classical scholar John Wesley Gilbert (1863-1923). You can also read my articles about Prof. Gilbert here and here. Prof. Gilbert graduated from Paine Institute in Augusta, Georgia, then received his BA from Brown University in 1888. As a Brown MA student in 1890-1891 he became the first African American to study in Greece at the ASCSA. During his year in Greece, Gilbert participated in the American School’s excavations at the ancient site of Eretria on the island of Euboea. I will be speaking about Prof. Gilbert at the Lucy Craft Laney Museum of Black History in Augusta on April 30th at 5:30pm; and also at the Methodist Heritage Center in Lake Junalaska, NCon Thursday, May 2nd. My exhibition on Helmets of the First World War is no longer on display at the UCSB Library, but you can still visit the online exhibition web page. I study the history of ancient West Asia, including Greece and Achaemenid Persia. My research focuses on war, society, and culture in the Greek and Achaemenid world from ca. 650-330 BC. I am also interested in receptions, interpretations, and representations of antiquity in the United States, especially during the late 19th century. My recent publications include essays on Xenophon of Athens, on Achaemenid frontier defenses in Anatolia, and on Cyrus the Younger and Artaxerxes II, along with an edited volume on comparative borderlands studies. I am currently completing a book about John Wesley Gilbert (1863-1923), the first African American to attend the American School of Classical Studies at Athens. I am also working on a book about Civil War and Revolt in Achaemenid Persia. Other projects include articles on humor in Xenophon’s Anabasis and on classical Greek literature in mid-19th century Mexican and U.S. culture. I teach graduate and undergraduate Greek and Achaemenid history courses, survey courses in ancient world history, and classes in the history of warfare from antiquity to the present. 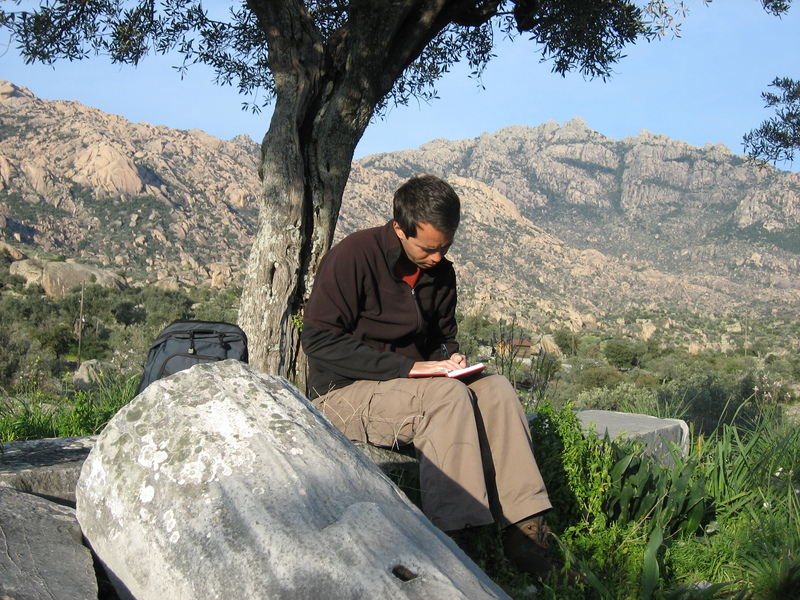 I have run archaeological field schools and travel-study programs in Greece and Turkey, including a Summer Session for the American School of Classical Studies at Athens. I am a member of UCSB’s interdisciplinary Ancient Mediterranean Studies PhD Emphasis, the Ancient Borderlands Research Focus Group, and the UCSB Iranian Studies Initiative. I serve as faculty advisor for the UCSB Student Veterans Organization (SVO). If you are a student veteran on campus or a veteran planning to attend UCSB, please feel free to contact me for information about the SVO and support for student veterans at UCSB. UCSB has a vibrant, cohesive, multidisciplinary ancient studies community that brings together faculty and students from History, Classics, History of Art & Architecture, Religious Studies, Anthropology, and other departments. Our Ancient History PhD program emphasizes both research and teaching. We provide supportive, rigorous graduate mentoring and treat our graduate students as colleagues in training. Through our seminars and lecture series, our graduate students have the opportunity to meet distinguished visiting scholars from around the world. Our PhDs have found success in tenure-track positions at research universities and liberal arts colleges, and in non-academic careers. In addition to campus-wide and departmental funding, graduate support for ancient history students is available through the Drake and Sizgorich Funds and through UCSB History Associates. For more information about the UCSB graduate program in Ancient History, please read our departmental field description. The application deadline for 2019-2020 has passed. If you are interested in applying for 2020-2021, please contact me before submitting your application. ARCHE Project: Advanced Research in the Comparative History of Empires. Digital Athenian Empire and online atlas of Achaemenid Persia (under construction). in M. Flower (ed. ), The Cambridge Companion to Xenophon, 15-36. Cambridge University Press, 2016. Reviewed in Bryn Mawr Classical Review. co-edited with Michael North (Greifswald University). University of Nebraska Press, 2016.
Review of Richard Stoneman, Xerxes: A Persian Life. American Historical Review (2016) 121.4: 1343-1344.
in J. Collins and J. Manning (eds. ), Revolt and Resistance in the Ancient Classical World and the Near East: In the Crucible of Empire, 103-121. Brill, 2016.
in J. Armstrong (ed. ), Circum Mare: Themes in Ancient Warfare, 262-281. Brill, 2016.
in B. Campbell and L. Tritle (eds. ), The Oxford Handbook of Greek and Roman Warfare, 143-161. Oxford University Press, 2013. DVD/audio series, 24 thirty-minute lectures. The Great Courses/The Teaching Company, 2012. Click the link above for a video preview and a complete list of lectures. in Victor Hanson (ed. ), Makers of Ancient Strategy. Princeton University Press, 2010. Read a review here. in Robert Strassler (ed. ), The Landmark Xenophon’s Hellenika, 391-394. Pantheon Books, 2009. Cambridge University Press, 2007. Nominated for the 2008 Runciman Award. Reviews here and here. in Alex Vernon (ed. ), Arms and the Self: War, the Military, and Autobiographical Discourse, 141-160. Kent State University Press, 2005. The Ancient World 35.2 (2004), 145-165. British Archaeological Reports S958 (2001), 11-22. An introduction to the early civilizations of Africa, the Americas, Asia, the Mediterranean, and Oceania. Next offered: 2020-2021. Topics include Neolithic culture in the Aegean, Bronze Age Minoan & Mycenaean civilization, the Late Bronze Age international system, the historicity of the Trojan War, and early Iron Age Greece. Next offered: Winter 2020 (tentative). Topics include the polis (“city-state”), Greek-Persian interactions, the society and culture of classical Greece, the Peloponnesian War, and the rise of Macedon. Next offered: Spring 2020 (tentative). Topics include the campaigns of Alexander, the formation of the Hellenistic kingdoms, Greek federal states, Hellenistic science and technology, and ethnicity and culture in the Hellenistic world. Topics include the development of the eastern Greek poleis, Anatolian state formation, interactions between Greeks and non-Greeks in western Anatolia, and the effects of empire. Ancient Persia from Cyrus to Alexander. Topics include the development of Achaemenid imperialism, economic and social history of the empire, art and architecture, and cultural interactions amongst Persians, Greeks, and others. Winter 2019. Research seminar for history majors. Participants write a 15-20 page paper. Next offered: Spring 2019. Upper-division lecture course; topics vary by quarter. Most recent topic: The Age of Xenophon, ca. 430-350 BC. Recent topics: Historiography of Classical Greece & Achaemenid Persia. Most recent topic: Civil War, Revolt, and Rebellion in the Greek & Achaemenid World. Mitrou Archaeological Project. Field School Co-Director, 2005. Cornell Halai and East Lokris Project. Excavation Staff, 1999-2004. The Cyrus Cylinder and Ancient Persia– Hellenic Public Radio 91.5FM NYC. Persian History in California Public Schools– Pacifica Radio KPFA 94.1 Berkeley. What do you know about Ancient Persia?– ‘Ōlelo Community Media, Honolulu. History Advocates: A Community Effort for Accurate Portrayal of Persian History in California Schools. Our interdisciplinary program brings together faculty and students from six different UCSB departments. The premier professional organization of ancient historians in North America. Essential research tools, publications, and information for the study of Achaemenid Persia. Founded by Prof. Pierre Briant. A center for research and teaching since 1881, the ASCSA is the oldest U.S. overseas research institution. Watch lectures by Pierre Briant, Mark Garrison, and Michael Jursa. Includes a 12-minute video with aerial photos and 3D reconstructions of ancient Persepolis. Links to databases, bibliographies, and other research tools for studying ancient history. A research tool for studying Iranian civilization and culture from ancient times to the present. Texts, translations, and commentaries for hundreds of Athenian inscriptions. A classic 1983 series on warfare and warriors from ancient to modern times.